For a winter side-trip, look for outstanding skiing in Washington State’s Cascade Mountain Range. You don’t have to travel far to enjoy downhill runs, snowboarding, or cross-country trails. A two hour drive south of Seattle Crystal Mountain and White Pass are the two ski areas at Mt. Rainier. Crystal Mountain has ten ski lifts plus the new Mt. 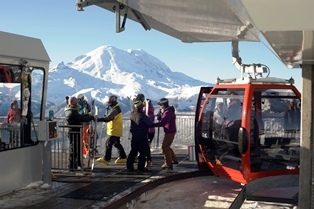 Rainier gondola that takes you to over 50 runs including the 2.5 mile Northway with a 3,100 foot vertical drop. There are also gentle groomed cruising runs for families and backcountry snow shoeing areas. For a week-end getaway, check out one of the three lodges at Crystal. Photo: Crystal Mountain. www.crystalmountainresort.com. Summit Central has runs with small to large jumps and a fleet of over 70 features for skiers and riders of all levels. From Central Express to Holiday, chair lifts take you to runs and trails for your next adventure. There are a number of places to catch a bite to eat all round the Summit including Silver Fir Lodge. Summit West features a great learning environment including a magic carpet for young skiers. This is the place to catch great tracks for night skiing and is a favorite for boarders. Summit East is Nordic Central. There's consistent fall line terrain, some really nice glade runs and 50 kilometers groomed trails for snowshoe and cross country skiing. And let’s not forget the snow tubers. The whole family can enjoy groomed lanes and surface tows back up the hill. 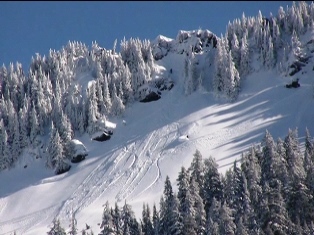 Alpental is perhaps the most beautiful and most challenging skiing terrain in the state. The Alpental Back Bowls and Backcountry features legendary terrain that can be the highlight of your day. Be sure you’re ready for skiing or snowboarding in this wild terrain by knowing the danger. Mt. Baker skiing gives you the most snow in the Cascades. I mean as much as 700 inches in a single year! All this great snow is 2 ½ hours drive from Seattle, two hours from Vancouver, B.C. and 75 minutes from Bellingham. Pick up a ‘Baker Bus’ from Bellingham to the ski slopes. Two ‘mile high’ mountains linked across the Fitzsimmons Valley by a Peak 2 Peak Gondola give you a chance to ski both mountains in one visit. Just 75 miles from Vancouver, British Columbia, Whistler Blackcomb has over 8,100 skiable acres, 200 trails, 37 lifts including Crystal Ridge Express and Harmony 6 Express, three glaciers and twelve alpine bowls. Yes, Whistler is big and hosted the 2010 Winter Olympics. Nordic skiing at Whistler takes you to areas like scenic Lost Lake Park, guided snowcats get skier & boarders to the backcountry, and the Base 2 Zone Tube Park has eight lanes of runs for more fun in the snow. You may want to consider taking a clear day off the slopes for a scenic flight over Blackcomb and Whistler Mountains, the Village and peaks, rivers and glacier fed lakes in Garibaldi Park.